I've worked in a hazardous waste lab, where under the sign for the Right To Know law, was added: if you can figure it out. I've been a metals tech, a bakery clerk, a professional gardener, and taught human anatomy and ran two university greenhouses. Along the way I picked up my Master's Degree in Biology, specializing in the population genetics of an endangered plant. I am also a top breeder, handler, trainer of English springer spaniels, with three in the equivalent of the National Club's (ESSFTA) hall of fame. Every time I think I know dogs, another dog comes along and proves my beliefs are totally wrong. 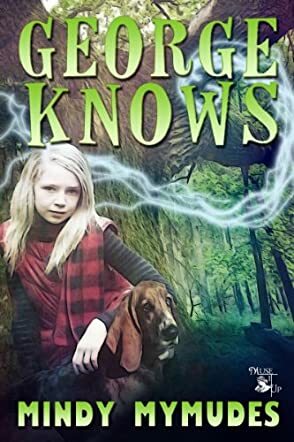 George Knows by Mindy Mymudes is the interesting story of George and his girl-pup, Karly. It is George's duty to train Karly. In the process, he finds himself being taken on an adventure which will teach him more about himself and help his girl-pup learn more about becoming a witch. The story is written from a dog's point of view and the author has done an outstanding job in combining the human characters with the dogs. George, the magical basset hound, does a good job of telling the story to readers. The book is engaging and humorous. The characters in the story are funny and reveal the imagination of the author. Apart from training Karly, George also has to save their nearby park from being destroyed by builders and solve the mystery of a murder. The book has a lot of things happening simultaneously, which makes it fast paced and keeps readers glued to the pages. The characters are lovable and the twists and turns make the story exciting. The theme is original and refreshing. George's antics and humor will remain in readers' hearts long after you finish reading the book. The book has a bit of mystery, fun, humor, and a lovely relationship between George and Karly. I recommend this book not only for children, but also for adults. The affable characters and the original theme make it a good read.